Google had released Android 4.1 Jelly Bean at Google I/O Conference 2012 and have also integrated its new Android Mobile Operating System on many upcoming Android Smartphones and Tablets devices including Google Nexus 7, Galaxy Nexus, Motorola Xoom etc. 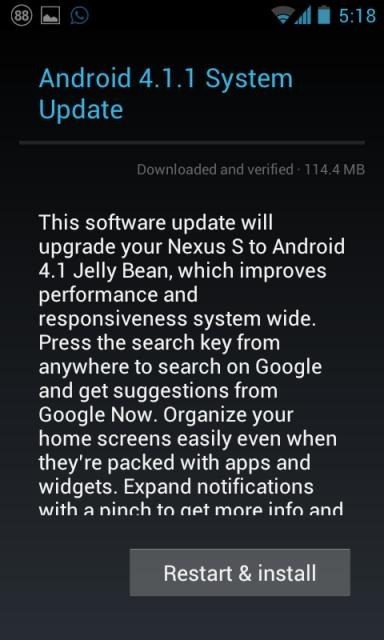 and now Android 4.1.1 Jelly Bean is also available for Google Nexus S Smartphone. If you have not upgraded or updated your old Android Firmware to the latest Android 4.1.1 Jelly Bean OS on your Google Nexus S device so do it now and get many new and updated features with Android 4.1.1 Jelly Bean like smooth user interface, more powerful notifications, optimized keyboard with next word prediction and offline typing, improved battery performance and most amazing feature of Google Now voice searching feature. The full changelog for the update can be found here. 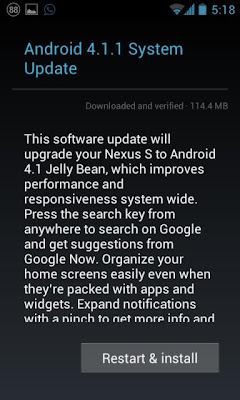 Android 4.1.1 Jelly Bean OS can be easily upgraded on Nexus S device via Over the Air (OTA) and can also be install manually. 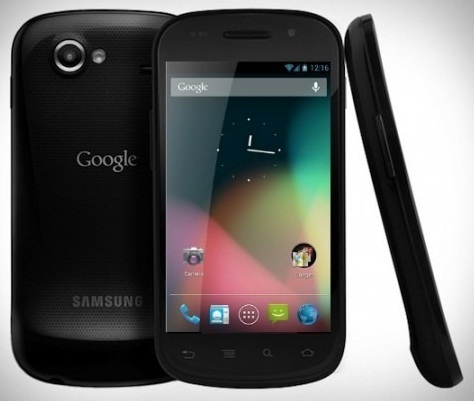 In this post we will tell you How to Download, Install and Flash Android 4.1.1 Jelly Bean OS On Nexus S (i9023/i9020/i9020T/i9020A) Devices. If you want to Upgrade and Install Android 4.1.1 Jelly Bean on Nexus S (i9023/i9020/i9020T/i9020A) Smartphone via OTA the setup file size is approx. 114MB for all the regions worldwide, which will brings the Google Nexus S build up to JRO03E for users with either the i9023/i9020/i9020T/i9020A hardware variants Or you can also Download and Install Android 4.1.1 Jelly Bean on Nexus S directly from Google's server with the link available below. If any user wants to Flash Android 4.1.1 Jelly Bean on Nexus S device than you have to make sure you're running a custom recovery (like ClockworkMod) and a stock ICS ROM (the update assert looks for IMM76D), copy the zip to your device, and flash as normal. So let’s start the Tutorial and Guide to Download, Install, Flash and Root Android 4.1.1 Jelly Bean On Google Nexus S (i9023/i9020/i9020T/i9020A) Devices. How to Download, Install, Flash and Root Android 4.1.1 Jelly Bean On Google Nexus S (i9023/i9020/i9020T/i9020A) Devices? Before starting the steps and procedure you need to know that by implementing the Android 4.1.1 Jelly Bean flashing process you will be void manufacturer warranty and in case you want it back you will need to apply and implement the original Android 4.1.1 Jelly Bean firmware so try it at your own risk and we are not responsible for any damage incurred to your Android device. Now let’s start the Tutorial and Guidelines to Download, Install, Flash and Root Android 4.1.1 Jelly Bean On Google Nexus S (i9023/i9020/i9020T/i9020A) Devices. Step 1: Unlock bootloader, Root and Flash ClockworkMod Recovery Tool (Download All In One Nexus Root Toolkit) on your Google Nexus S device. Step 2: Download Android 4.1.1 Jelly Bean (JRO03E). This .zip file is for update to Jelly Bean from Android 4.0.4 (Build: IMM76D) on Nexus S models i9023/i9020/i9020T/i9020A. Place this directly under /sdcard on your Nexus S’s internal storage. Step 3: Reboot into ClockworkMod (CWM) Recovery by shutting down your Nexus S, and then pressing and holding Volume Up + Power buttons. Step 4: Take a NANDroid backup. This will come handy later on if you find any issues with the Jelly Bean ROM. Step 5: Navigate to install zip from sdcard > choose zip from sdcard > [.zip file you downloaded in Step 2]. This will flash Android 4.1.1 Jelly Bean to your Nexus S.
Step 6: From CWM’s main menu, select reboot system now. Congratulations!! You have successfully Flash and Upgraded to Android 4.1.1 Jelly Bean on Google Nexus S device. If you have followed the above steps correctly than you must get your Android 4.1.1 Jelly Bean on Google Nexus S models i9023/i9020/i9020T/i9020A and if not or if you facing any problem with it, check out the official thread over on XDA Developers. To check whether the rooting process has been successful or not, you can download the rooter check app from Google Play App market, it will notify you if your Android device has been rooted or not. Enjoy! BEWARE: The above Content and Tutorial was provided by redmondpie and we at TechGlobeX don’t support or promote piracy in anyway. This article is purely for informational purposes only and we are not responsible for any damages, software and hardware loss occurs when implementing above method. Downloading and installing cracked apps are illegal. The whole purpose behind above tutorial and guidelines is for app testing and we encourage peoples to purchase original app directly from App Market.